2015 proved to be a bit of a challenge because it was held on September 11th,12th and 13th. In previous years the local universities provided about half of our volunteers, this year was no different but we had fewer students and therefore our meals packed was a little less. We packed 1,006,000 meals. We had over 1,300 volunteers from Missouri State which includes faculty, staff and students. The meals were shipped internationally to Liberia, Mexico and several organizations in Haiti. We also provided meals to 14 area pantries and feeding programs. In 2014 at our Third Annual Meals A Million we met many wonderful people. We had 47 packing sessions with an average of 112 people per session. Their work together provided 1,160,000 meals. The meals were distributed to area pantries in and around Springfield. Also two and a half shipping containers went to Haiti, Mexico and Liberia. The work from the weekend will care for people around the globe. 2013 - Our Second Annual Meals A Million Pack-A-Thon was a huge success. With the help of over 5,000 volunteers we packaged all the ingredients we had on hand. Totalling 1,004,081 meals. Many hungry people received healthy meals because of our donors and volunteers. We thank you for your passion to help those in need and look forward to seeing you next year. Friends Against Hunger will host the first annual pack-a-thon November 9-11th. Many organizations, groups and individuals from across the area volunteered and packaged meals. The meals were used in Haiti, Mexico and in the U.S. both on the east coast and here in the Springfield Area. We are happy to report our event was successful and we shipped over 1 MILLION MEALS. Now we will plan our second annual Meals A Million, November 15, 16, and 17 at the Springfield Exposition Center located at 635 E. St. Louis St. in Springfield, MO. 4,500 volunteers are needed for 2 hour shifts. In May 2012 we closed our office and warehouse located at 2006 E Phelps to allow us to focus on our upcoming Meals A Million event. This will allow us the time necessary to raise the funding needed to package one million meals and recruit volunteers to help with the event. We have 275,000 meals in our warehouse and initially we were going to send food to Haiti, but because the conditions in Kenya have deteriorated to critical levels, we feel we need to change our plans. The eastern African countries have experienced horrible drought conditions and that coupled with the civil unrest in Somalia is driving a massive number of desperate people into Kenya. USAID estimates 29,000 children under the age of 5 have died in this area of Kenya in just the last 90 days. We believe the right thing to do is to help the suffering people in Kenya. We will ship our food to Kenya on Friday, August 12. We will immediately order new ingredients and have them shipped to us to begin packaging meals for other poor people around the world. We need your help to buy ingredients and to package meals. Youth Empowerment Project primary goal is providing financial support to youth-created and youth-driven service projects in Springfield, Missouri. Youth organizations of all ages are urged to submit project proposals to the Youth Empowerment Project Grants Advisory Board. Our organization was one of several organizations selected to receive a grant. Many of the members of the Youth Empowerment Project have also volunteered their time packaging meals at our office. The grant will be used to provide 3,571 meals to The Kitchen a local organization providing assitance to those less fortunate. Valerie Lorensen picked up the food in May for distribution at The Kitchen. She stated, there are many more families asking for assistance because of lost jobs and the depressed economy. Friends food will provide healthy meals for hungry people in Springfield, thanks to the Grant from Y.E.P. and the work at The Kitchen. Springfield stepped up to the challenge to help support the people of Haiti after the devastation of the earthquake turned their lives upside down. Many individuals as well as groups donated items to our organization to support the "Help for Haiti Project". Between January 15th and the end of March we received 4 full pallets, four feet wide by four feet deep and 8 feet high with an estimated value of $25,000. The items include medical supplies, alcohol, hand sanitizer, hygiene goods, baby formula, tents, tarps, flashlights, work gloves, over the counter medications, crutches, peanut butter, canned meats, etc. Groups from Springfield, Fair Grove, Republic and the St Louis area collected and helped prepare the items for shipping. Some of the organizations that collected and delivered items for Haiti were Gaitley’s, restaurant, Vineyard Fellowship Church, Cox Nursing School, Boulevard Baptist Church, Walnut Street Baptist Church, Drs. Joni and Mike Scott, Glendale Christian Church, Ruth Stegner, The Elegant Child and several others. Lifeline received the first shipment that contained 230,000 meals and 4 of the pallets of goods for Haiti. The first shipment cleared Haitian customs at a very critical time because the news has moved on to other crisis in the world and we have lost site of the struggle in Haiti. Lifeline works very hard to support the people of their community. Many of the families still living on the property at Life Line are living in far less than desirable living conditions, similar to a long rustic camping trip that has lasted over three months. Life Line will be able to distribute food, clothing, supplies, and other greatly needed supplies to the poorest of the poor people in Haiti. It will also be used to support the children’s homes and schools in Haiti. Thank you to Laura a student from M.S.U. for her time and effort she spent redesigning our Friends Against Hunger – Springfield logo, stationery, posters and brochures. Her work resulted in clean and creative ideas. We are excited about our new look and look forward to incorporating our new logo on our website, business cards, and t-shirts. Laura’s work will be on display at the MSU student center located at the corner of Walnut and J.Q. Hammonds streets for the next week, also they will be open this Friday evening as a member of the First Friday Art Walk, May 8th from 6-8. Please stop by and see Laura’s work. Not long after hearing of the earthquake in Haiti, Ricky, Dominick, Blake and Cameron Morsovillo looked for a way they might be able to help the people of Haiti. After some consideration and help from their parents they sprang into action by setting up a lemon aid stand, selling glasses of refreshing lemon aid to friends and neighbors. Their stand was able to raise $25 for the people of Haiti. The Morsovillo boys then decided to find a local charity with an active Haiti project. The boys selected our organization for their project, Help for Haiti. 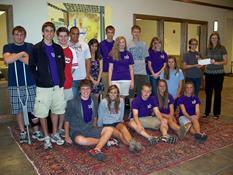 The money they collected will provide 175 meals to the children of Haiti. They also came and volunteered their time to package the meals that will be sent to Haiti. They are mking a difference with their hard work and care and concern for the Haitian people. The students of Field Elementary collectively donated $704.00 to us. This fund raising project began as an idea from two second grade children. They approached their teacher who in turn contacted Mrs. Zettl, the Guidance Counselor and Adult Sponsor of Student Council. The second grade children made and decorated a collection container, beginning the awareness of the project. Mrs. Zettl worked with the student council to come up with an action plan to raise money. The Student Council selected a simple but effect program with a goal of $1 from each and every student, which would result in collecting just over $400. They put a printed note in a baggy and sent the baggy home on Friday and the children would return them Monday with change. This went on for several weeks resulting in over $700 being collected from the Field Students. One second grade class actually collected $192. During this project the teachers used each step as a learning opportunity. By showing the location of Haiti in respect to U.S., the cause and effect of earthquakes on the earth and people living on or near the epicenter, as well a written documentation of their plan of action. Their hard work does not end there, the 5th grade classes will come to KAH on April 21st and package the 5,000 meals that will be sent to Haiti. Through their hard work and big heart these children are providing a fine example to other children in the community. Just days after the earthquake in Haiti we were able to donate meals for the Haitian people. Convoy of Hope was able to ship within days of the earthquake and their shipment included 140,000 meals. The food provides a well balanced meal that will help sustain malnourished people. Thanks to the donations we received last year and the people who volunteered their time, we had food ready to go. The first of March we will ship an additional 250,000 meals along with medical supplies, ready to eat food such as peanut butter, and personal items. Prime, Inc. participates in Make A Difference Day by donating over $3,000 and packaging meals for two hours. Prime, Inc. organized a group of their associates for the purpose of supplying food to the Springfield Area. Associates at Prime collected contributions and packaged meals for hungry people in Springfield. Robert and Lawana Low of Prime matched all funds collected and donated by Prime associates allowing us to provide over 20,000 to Rural Compassion for distribution to needy families in the rural area around Springfield. There is a great need in the rural areas around Springfield and the efforts of Prime's Associates will help fill that need. Commerce Bank managers make a cash donation and package meals. Commerce Bank made a much needed cash contribution to help feed hungry people. Every year Commerce Bank provides support to various local non-profit organizations. This year the members of Retail Management Team from Commerce Bank made a cash contribution and packaged meals. The Branch Managers from Lebanon, Bolivar, Nixa, Republic, Willard, Ozark, Branson and Springfield Commerce Banks gave their time to help those less fortunate. KAH-Springfield ships a container of meals to Life Line Christian Mission in Haiti. Life Line is a well established Faith Based organization with a proven track record for feeding hungry people in Haiti, Honduras and now Cuba. We visited Life Line in May and are pleased to report they have a wonderful organization with adequate controls and a clear and concise mission. We plan to continue to provide meals for the Life Line Mission. Tuesday, April 7th, Pipkin Middle School Students took time out of their busy schedule to package food for the less fortunate. Amy Rosser is the teacher in charge of organizing and coordinating the volunteer effort of Pipkin Middle School. Once a month about 50 students help package meals. 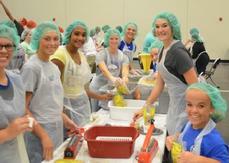 Tuesday the students packaged over 11,000 meals in two hours exceeding their self imposed goal of 10,000 meals. We thank Pipkin for their dedication to helping those less fortunate. They are MAKING A DIFFERENCE one meal at a time. Grace celebrates her birthday by giving other children a gift. A special THANK YOU to Grace for celebrating her Birthday with us. Grace not only organized a packaging session with Kids Against Hunger but she asked in lieu of gifts her friends and family donate money to Hungry People. Grace has a passion for those less fortunate and that was made very clear with her generous contribution to helping hungry people Grace's friends and family donated over $400 which will fund 2,850 meals or feed 30 children people for a month. March 20th we shipped 72,000 meals to Vineyard Missions in Mexico. They are a faith based mission with the purpose of improving the life of the people they serve. They provide meals to 5 different locations one being a Dump site community. On March 26th Kids Against Hunger will ship 285,000 meals to Food for the Poor to support their work in Jamaica. Food For The Poor (FFP) was established in 1982 and is a non-profit corporation with the mission to improve the health, economic, social and spiritual conditions of people throughout Latin America and the Caribbean. We were able to see KAH food at work in the Children's center in Singida Town, Tanzania. It was a blessing and the children are getting healthier with every meal they receive and every drink of clean water they take. Many of the children eat only one meal a day. 350 Children eat lunch each day. In order to eat at the center a child has to attend school. We need your help to get more children in school and eating. Education will help break the cycle of poverty in Tanzania. The average income in this area is about $2 a day. Many of the children of the street have lost parents to AIDS or other illness but some of them have parents, but the parents have been forced to make the impossible choice of turning out one or more children into the streets because they can not provide for all the members of the family. The street children steal, or adapt unhealthy life styles to survive on the streets. I will never forget one imaging of Africa, those children outside the gates of the center, they will NOT even have one healthy meal a day. We are launching a special program to buy school uniforms, get them in school and feed the street children of Singida and Manyoni, Tanzania. With your help we can provide a promising future for the children of Tanzania. Make a Difference Day was a huge success. We had over 50 volunteers and packaged 17,700 meals. Who helped? Our youngest volunteer was five and came with her older sister and mother. Girl Scout troops 628 and 283 came for two hours. Supporters from Prime helped for three hours. Friends from Schweitzer helped for three hours. Fifteen young men and women from Hartville Freewill Baptist came for one hour. The feeding pantries in Springfield are experiencing about a 30% increase in the number of families receiving assistance, many of these families are receiving assistance for the first time. The Kitchen is the largest provider of services for homeless children and families in Southwest Missouri. They feed and shelter many families from our area. They have feeding programs at several locations. We donated 7,000 meals to the Kitchen. Please help us expand this program so we may continue to give them the greatly needed meals. The Salvation Army in Springfield uses our meals in their feeding programs. Wednesday, July 30th we loaded and shipped a container with 256,608 meals to Haiti. The food will be distributed by Life Line Ministries, and New Hope Haiti Mission, and Balan Ministries in Haiti. The three organizations have experience with food distribution and accountability. They work with many schools and churches and have established feeding programs primarily for children and some families. They also operate schools, medical facilities, and a dental office. Volunteer Doctors help with short term medical missions to provide complete services for the poorest of the poor. Kids Against Hunger Global needs our help to complete a container for Haiti. We were able to help KAH Global in Tulsa, OK complete a container. They picked up 100,000 meals from our warehouse on April 25, 2008. Feeding Children International, Stewart, MN also provided 100,000 meals, that coupled with KAH-Global 85,000 meals completed a container. Haiti has a large population of extremely poor people living in substandard living conditions. The 285,000 meals will provide much needed relief for the many missions in Haiti. One of the orphanages we helped support has 209. Rose and Mark Sundet along with their children picked up 4,000 meals from our Kids Against Hunger-Springfield location and will deliver the food to Waverly, IA to aid the flood victims in that area. The Sundet's have volunteered many times at Kids Against Hunger and are wonderful supporters of our cause. The Vineyard Church in Waverly, IA along with other churches in the area were also affected by the storms, but after clearing away water and damaged materials they joined in the recovery process for the community, by offering assistance and food to the community. So our food will be a welcome relief to their feeding program and food bank. The Vineyard Church of Waverly will distribute the Kids Against Hunger meals to the families affected by the tragedy. DesMoines, Iowa Churches team up with Outreach, Inc. from Union, Iowa to set up a city-wide event to package 3 million meals in one week. The event was called Meals of the Heartland with the help of many churches, girl scouts, boy scouts, and other civic groups they met and exceed their goal and packaged 4,000,000 meals. Several K.A.H. joined together to help at the Packaging Event; Feeding Children International of Stewart, MN, Kids Against Hunger, Naples- Kids Against Hunger, K.A.H. of DesMoines, International Outreach, Inc and, Kids Against Hunger Springfield. The group furnished meals to many different organizations in the U.S. and around the world.